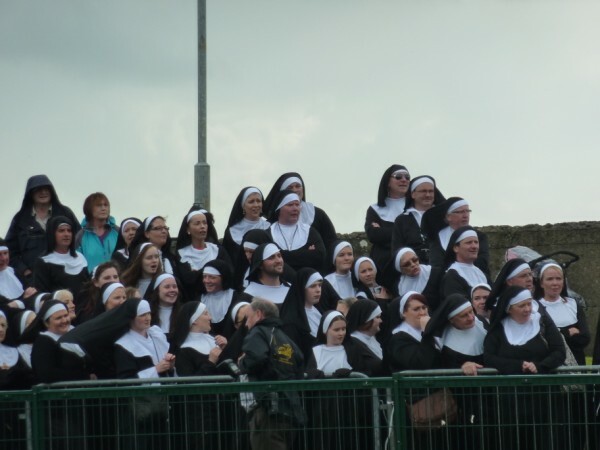 More than 1,400 revellers dressed as nuns flocked to a village in Kerry last weekend to smash a Guinness world record. Men and women dressed as nuns descended on Listowel on Saturday for ‘Nunday’ to help raise funds for Pieta House, a charity aimed at preventing suicide and self-harm. The crowd broke the previous record, which stood at 250 for the largest meeting of people dressed as nuns. Organizer Cora O’Brien told TheJournal.ie how they ran out of habits for the participants. “We’d initially expected a couple of hundred people to take part but the whole thing just took off over the past week and we actually ran out of nuns’ habits a few days ago,” said O’Brien, who lost her son to suicide in 2007. “The excitement in the town was immense and everyone really got into the spirit of things,” said O’Brien. Organizers provided all registered participants with a black habit, a white coif, and a black veil for the event. The official count took place at 6 o’clock in a football field in Listowel . Afterwards, the 1,436 nuns paraded through the town.